It's just after noon in Peterson Cove as Marie and Ron Bader head to work. The sun is high in the September sky, warming the metal seats of their skiff, but the water that sprays off the stern is rousingly cold. It's a quick commute for the retired teachers turned oyster farmers. Pushing off the shore outside their stilted cabin in Kachemak Bay, Ron motors the duo (and a few nets holding some of the juvenile oysters they've been raising) just around the corner to the work dock moored near their oyster field. The two step stiffly yet gracefully from the bucking boat to the bobbing dock—they're plainly used to the motion of the sea, despite not starting this career until late in their lives. They start working quickly, fluidly, harmoniously. As Ron readies the sorting table, Marie unties the compartments of the 10-tier net. Then, each taking one end, they empty the rounded net, sending a wave of oysters clunking onto the stainless steel table. "Man, there are some real beauties in here," Ron says, picking up a maroon striped oyster and running his thumb across its heavily ruffled bottom cup. "Oh, I know. I never get tired of emptying a net," Marie says. "It's like playing poker. You never know what you're going to get." While many may see the principal allure of oysters in their tan meat and pearly inner shell, the Baders are drawn to the colorful outer shells—the bit buried in the crushed ice when these delicacies are served on the half shell. Spread across the table, the couple turn the shellfish this way and that to catch the light like a jeweler would inspect fine gemstones. Some are colored a delicate pink. Others lined with rich purple hues. Others boast varying shades of red and brown and orange—there are more warm tones here than you'd find in the makeup aisle. Most on the table showcase the bounty of the ocean in miniature. On their fluted shells grow a myriad of baby creatures: barnacles, soft shell clams, tubeworms, mussels, rock oysters, sponges, plant life. The ride-along organisms won't last long though. As they're sorted into like-sized pails, the farmers rough the oysters across a metal mesh to clean each shell, similar to scrubbing laundry on a washboard. Granted, not all the oysters end up in the pails. Every so often, one or the other will shuck and slurp the briny contents. "There's nothing like it," Marie says, holding the now empty cup and smacking her lips. "And you know, it's a minor miracle that we can even do this." Oysters don't naturally grow in Alaska. 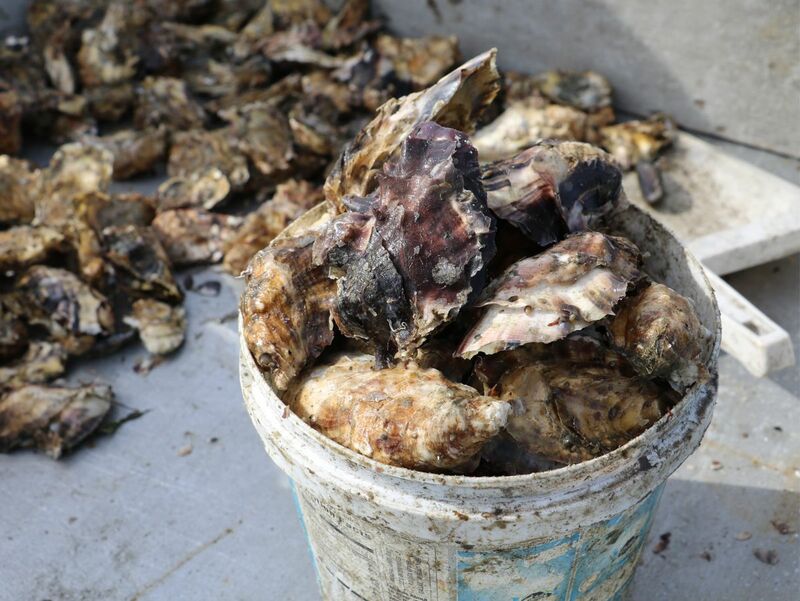 It wasn't until the late 1980s that legislation allowed for juvenile oysters to be planted in Alaska. The intent was to create another industry to contribute to Alaska's economy and strengthen the competitiveness of Alaska seafood in the world market. The chilly waters off Alaska's shores both helped and hindered oyster growth: It made the meat sweet, but stunted their sexual maturation, meaning they couldn't reproduce. For decades, that meant oyster farmers across Alaska, from Annette Island near the Canadian border in Southeast Alaska to Kachemak Bay, had to import seeds from shellfish hatcheries in Washington state. For the Baders and other area farmers, that was frustrating. It wasn't very sustainable and they were tied to their suppliers to get the seeds for their livelihoods. Marie likened it to being able to grow your own garden. If you're not able to grow things yourself and are cut off from the grocery store—due to a missed barge or fire, for example—there aren't many options available for getting food. "We wanted the security of having our own seed so we'd be able to manage every step of the process from seed to plate," Marie said. The Kachemak Shellfish Growers Co-op, of which Marie is president, decided it was paramount to start their own processing facility. With a facility in place, they could spawn oysters, raise them to seed size and provide stock that could be transplanted in the bay. Local, affordable seed would streamline operations for the 12 farms in the co-op. Experts in the field pooh-poohed the idea. Too many barriers. Their facility on the Spit was a mere fraction of the suggested industry size for mariculture processing. Everything would need to be rigorously monitored. Others in Alaska had tried and failed, despite having more space, staff and funds. "We were successful the first year," Marie said. "Then those experts said, 'OK, let's see you do it again.' This is our fourth year of very successful seed harvest. Lightning doesn't strike four times in the same spot." To generate a spawn, the co-op puts a dozen oysters into a warm tank (waters need to be at least 70 degrees for the oysters to spawn) for a few weeks. As Marie puts it, once they've adapted to their warm bath, they send out a signal saying "I'm a girl, I'm a girl" or "I'm a boy, I'm a boy." If all 12 oysters are girls, a few will simply switch sexes and procreation can begin. The seeds grow from a microscopic size (roughly 3 million would fit in the palm of your hand) to the size of one's pinky nail. Like razor clams, the seed has a foot that is used to swim around the tank. That foot allows them to stick to one of the crushed shells on the tank floor, which they'll then ingest and use to form their own shell. The process needs constant monitoring. If the temperature drops or rises by 3 degrees centigrade, everything will die. At roughly three months old, the seeds will be moved across the bay to Halibut Cove into a FLUPSY (a floating, upwelling system) that's mounted under a dock. The system force feeds the seeds and allows the oysters to bounce around in the bins, giving them nice, deep cups—a feature that is prized in the shellfish market. A year later, the oyster seeds are sold to farmers—primarily in Kachemak Bay, but also Wrangell, Prince William Sound and Washington state if supply allows. Farmers put them in tiered lantern nets. Once hung between buoys on long rows, they're considered planted and the circulating seawater (or, more specifically, the plankton) provides them with all the nutrition they need to grow for a few more years. Suspended culture (the tiered nets) make up a small percentage of all oysters raised in the world. Most oysters are raised on the beach. The State of Alaska, however, doesn't allow for beaches to be used for private enterprise. Those nets need constant upkeep. Several times a year, seaweed and waste is blasted off with a fire hose. Deadloss is removed. Oysters are sorted into like-sized groups. "Women in particular excel at this," Marie jokes. "We like to gab." While suspended culture oysters require more work, they're generally purer. Because they never touch the bottom, mud and grit isn't swept into them. It also means pearls are exceedingly rare. They also taste like the water they're grown in. The cold, clean water found in Kachemak Bay, Marie says, is what makes their oysters so crisp. "Eating cold water oysters is like learning to ski at Alyeska," Marie says. "We learned to ski there and then tried going to places in the Lower 48—what a breeze. Nothing like the black trails here. Once you eat cold water oysters, I don't think you could go back to warm water ones." Now the Bader's 24th season of oystering is almost over. They could work into the winter, but the work is strenuous and demanding enough in the warm months without the added challenges the winter weather would bring. "We're not so hungry anymore that we need to work year round," Ron says. "We farm hard in the summer so we can take winters off." On that September day, the duo were sorting and transferring the last few nets of oysters. In the months that will follow, they'll shift their energy to marketing their oysters to customers. Though their biggest market is undeniably Homer, where the words "fresh Kachemak Bay oysters" are found almost ubiquitously on menus (Grace Bridge Brewing even used 10 dozen of them to brew a stout last spring), the tide of oysters from the co-op has trickled throughout the U.S.—they've appeared in restaurants and personal kitchens in every state. "We have a lot of repeat orders from individuals," Marie says. "People who've had them up here and want to have a continued connection to Alaska and our seafood year round."